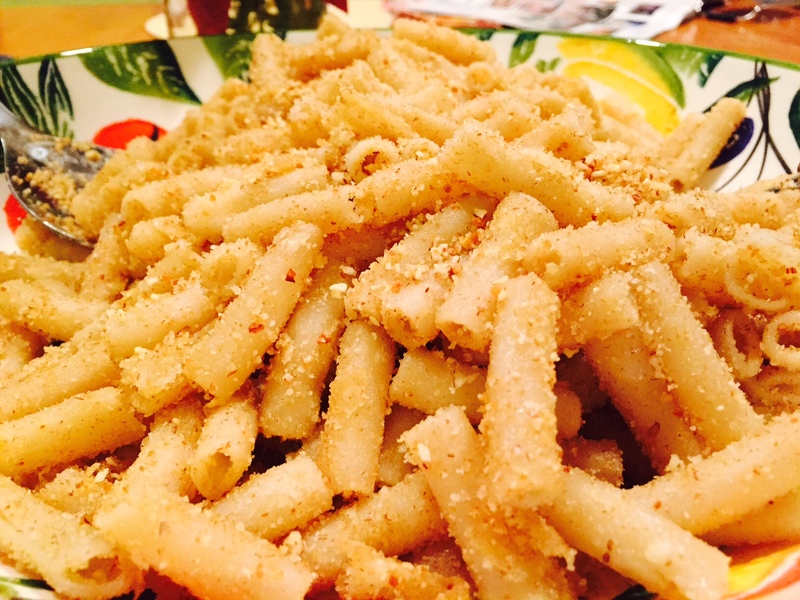 We picked a pasta with breadcrumbs recipe and it was a winner! We went through a phase where we made this A LOT. I felt good because it seemed a little better than their usual boxed (organic – ha!) mac and cheese. They loved it. Then I forgot all about this recipe and life moved on. Last week, my oldest (a senior in high school now!) asked about that crunchy pasta thing we used to make. So I went to the store, got the ingredients and he and I made it together. 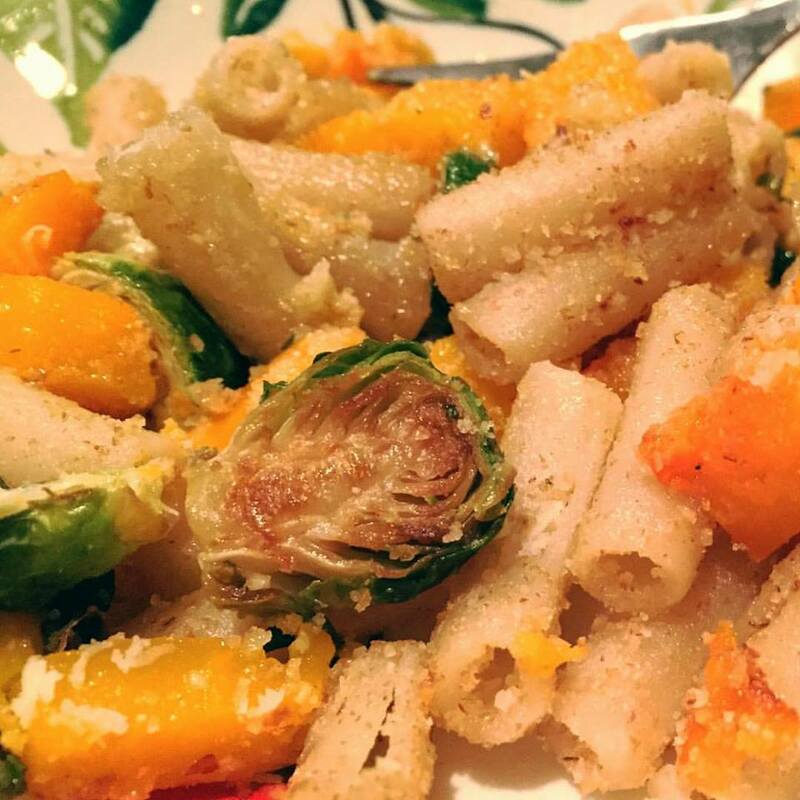 This time around I added roasted butternut squash and brussels sprouts and it was amazing. We started by making the breading, so simple. Just throw panko breadcrumbs, raw almonds and wheat germ in the food processor with a little sea salt and mix it all up. 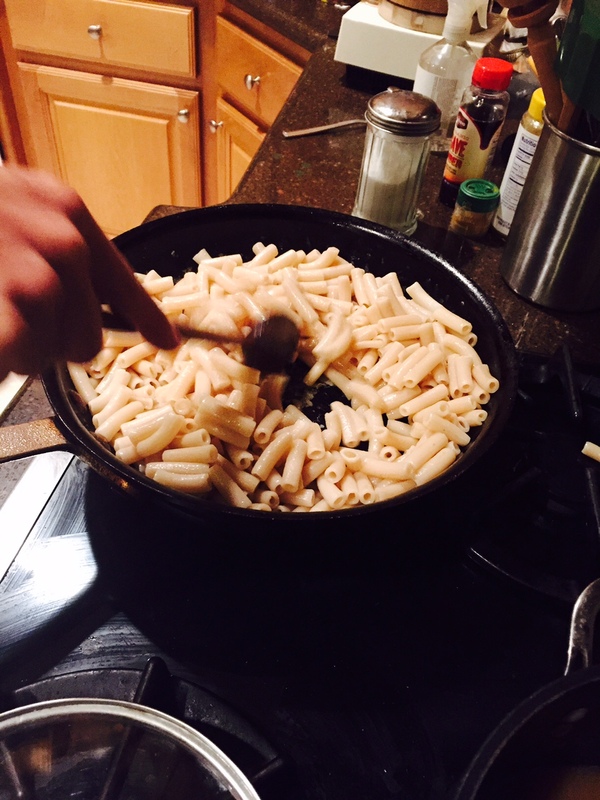 Cook the pasta and saute in olive oil and vegan margarine until it gets lightly brown and crunchy. Add the breadcrumb mixture and season to taste. This is a recipe with a lot of possibilities. You could add roasted broccoli, zucchini, carrots, onions…whatever works for you and your family. Pre-heat oven to 400F. Place cut butternut squash on a rimmed baking sheet, drizzle with about 1 tbsp olive oil and sprinkle with sea salt and pepper. Place brussels sprouts on another baking sheet, drizzle with olive oil and season with salt and pepper. Roast vegetables until tender about 20-30 minutes. Brussels sprouts will probably be done before the squash. Cook the pasta according to package directions. While pasta is cooking, make the breading mixture. Combine breadcrumbs, almonds and wheat germ in a food processor and pulse until mixture is the consistency of corn meal. Add 1 tsp of sea salt and combine again. In a large skillet over medium high heat, melt 1 tbsp vegan margarine and 2 tbsp olive oil. Add cooked pasta and saute until the pasta begins to lightly brown and become crunchy. Add about 1 cup of the panko breading mixture and stir to combine until nicely toasted. Taste and add salt and pepper to your liking. In a small skillet, melt 1 tbsp vegan margarine and add fresh chopped sage. Saute for a few minutes and set aside. Note: This recipe can be made gluten free without the wheat germ. It’s so good. Seriously. Let me know what you think.